An idea suggesting massive stone statues that encircle Easter Island may have been “walked” into place has run into controversy. In October 2012, researchers came up with the “walking” theory by creating a 5-ton replica of one of the statues (or “moai”), and actually moving it in an upright position, and have published a more thorough justification in the June issue of the Journal of Archaeological Science. If the statues were walked into place, then the islanders didn’t need to cut down the island’s palm trees to make way for moving the massive carvings, the researchers argue. The findings may help dismantle the traditional storyline of Easter Island, or Rapa Nui: that a “crazed maniacal group destroyed their environment,” by cutting down trees to transport gigantic statues, said study co-author Carl Lipo, an anthropologist at California State University, Long Beach. Rapa Nui’s majestic rock statues (also known as Stone Heads of Easter Island) have been a mystery since Europeans first arrived in the 1700s on the island, located in the Pacific Ocean off the west coast of Chile. Though the island was filled with a giant palm forest when Polynesians first arrived in the 13th century, the first European explorers found massive megaliths on a deforested, rock-strewn island with just 3,000 people. In the past, archaeologists proposed that a lost civilization chopped down all the trees to make paths to roll the megalithic structures horizontally for miles on top of palm trees used as “rolling logs” of sorts, from the quarries where they were created to ceremonial platforms. That transport method would have required many people, and led to deforestation and environmental ruin that would’ve caused the population to plummet. But Lipo and his colleagues wondered whether that made sense. For one, other archaeological evidence in villages suggested the island’s population was never that large, and the palm trees, essentially hardwood with a soft, foamy material inside, would be crushed by the rolling statues, Lipo said. To see whether the statues may have been walked, the team transformed photos of one 10-foot-tall (3 meters) statue into a 3D computer model, and then created a 5-ton concrete replica. 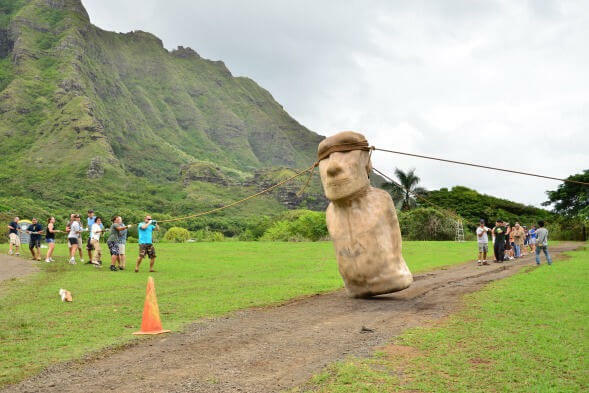 Last October, on a NOVA documentary, the team tried walking the replica, using people holding ropes on each side to rock the statue forward and back on a dirt path in Hawaii. “It goes from something you can’t imagine moving at all, to kind of dancing down the road,” Lipo told LiveScience. In the new paper, the team hypothesizes the builders carved the statues’ bases so they would lean forward, as it would’ve been easier to rock a statue with a curved bottom back and forth. Then, the builders would have flattened the bases to stand the statues upright once they reached the ceremonial platforms. Instead, Lipo’s team believes the population was probably always small and stable. The Polynesian settlers did cause deforestation, through slashing-and-burning of the forest to make way for sweet potatoes and through the rats inadvertently brought to the island that ate palm nuts before they could sprout into new trees. But that deforestation didn’t cause the civilization to die out: The palm trees were probably not economically useful to the islanders anyway, Lipo said. “It’s an entirely plausible hypothesis,” said John Terrell, an anthropologist at the Field Museum in Chicago, who was not involved in the study. “I don’t think you have to invent a very awkward, difficult transport method,” Van Tilburg told LiveScience. What’s more, Rapa Nui’s prepared roads were rough and uneven, and the statues would have been moved over hilly terrain, said Christopher Stevenson, an archaeologist at Virginia Commonwealth University, who was not involved in Lipo’s study. By contrast, “in the NOVA exercise it was like an airport runway,” Stevenson said. And the replica the team moved is on the small side for statues — some of which are up to 40 feet (12 m) tall and weigh 75 tons. It’s not clear the method would work for something much larger, Stevenson said.